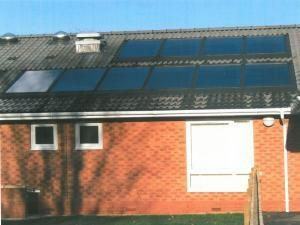 Birchwood, a newly built nursing home in Warrington, Cheshire, has been equipped with the ITS indirect solar system from A.O. Smith. Good experience with A.O. Smith water heaters in the past combined with local building regulation made them decide, in agreement with specifier KGA Partnership from Birkenhead, Merseyside, to choose an A.O. Smith indirect solar system. In solar configuration, an ITS indirect tank provides solar thermal energy when combined with a boiler. The ITS is fitted with 2 coils. In solar configuration the upper coil is connected to the primary circuit (boiler) whilst the lower coil is connected to the solar circuit. The top coil after- heats the water if the solar contribution is insufficient. The lower coil transfers the solar contribution which is collected by the solar collectors. G&J Seddon Ltd. from Bolton has installed 2 no. ITS 300 and 2 no. ITS 500 cylinders to meet the hot water needs for Birchwood nursing home. 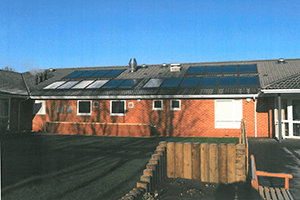 The solar panels are `built-in’ roof design with 2 arrays of 3 and 2 arrays of 5 collectors.